After another long pause in updating the blog because nothing really worth in my developer life was going on, I decided this tiring wait has to end. I have been doing a lot on the events side this last year: I’ve attended the Global Game Jam in january, been to the Netherlands in february to visit the Dutch Game Garden, NHTV, Vlambeer, Ronimo, etc., took part in the Lunarcade Factory jam, went to Napoli for the Brave New Game award in march, been to the No More Sweden 2011 in Stockholm in august, and at the GDC Europe ’11 as a volunteer. Apart from the three small games I made at the game jams, I posted no update on UFHO2 because, simply, there was none. 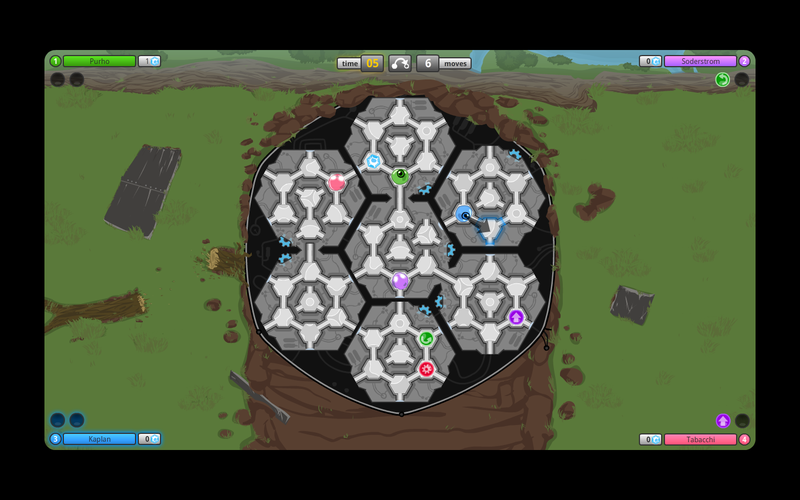 I am now organizing to resume working on UFHO2 100% of the time and finally see it finished. In fact, I already resumed the work on the graphics as you can see from the opening screenshot. The full details on how the reboot will happen will be revealed soon enough. Stay tuned! I went to the Netherlands some time ago, and I visited the Dutch Game Garden in Utrecht, which is super cool and interesting for game startups. Apart from a general tour of the structure given to me by Viktor Wijnen and Jan-Pieter van Seventer (the directors), I had the chance to meet a couple of developers that have their offices hosted by the DGG. Oh, wait wait wait… first read this blog post to understand the stupid jokes in the videos. The first LUNARCADE Factory event (read “game jam”) is over, and so is the game I made for it. Actually I went a bit over the limit, and the night I completed the game I stayed up until 5 AM just to put a final word on it. It didn’t come out too bad, to be honest! The music is from the always good Francesco D’Andrea. Bledge is in fact ready and downloadable from the event website! You can play it on the web (it’s a Flash game after all), or download it for PC or Mac (the Mac one has a cool icon :P). Oh, and check the other games too! There were a total of 11 entries, which is not bad at all considered the “localized” soul of the event. It was an exciting experience all in all, and cool to interact from home with the guys at the jam. I want to give you a preview of a small game I’m creating for the LUNARCADE game jam that is going on these days in Milan, organized by the always active guys of Santa Ragione and Cranio Creations. The theme of the jam is LINEE (“lines”) and, unlike other jams, people had the opportunity to participate from home. Since I didn’t want to go all the way to Milan -> €€€ (although now that I see the streaming I really wish I had gone) I decided to take part from here in Madrid. Bledge is basically a two player oblique Snake game, where each player has to guide a small spaceship and make the other one crash on his trail (tail?). Trails are made of three colors, variations in brightness of the same hue, and there’s a reason for this: the tricky part is that the other player crashes only if he crosses the trail on its dark side, otherwise he just passes over it. Each player can always pass over (and overwrite) his own trail, so he doesn’t really need to bother about it (this is different from all the other Snake/Tron games). Apart from that there’s two “special moves” to spice the game and create a bit of strategy: one is a boost that lets a player cover two tiles in one move, and the other is a spin of his spaceship which inverts the orientation of his trail (say, if the black side was on top now it’s facing down), so he can trap the opponent. The special moves cost energy which can be gathered by picking up some powerups on the stage. The threads for the jam on TIGsource and Indievault.it (There’s 19 concepts so far!! Although not all will be brought to completion…). The live feed of the jam (when it’s on, don’t forget it’s italian hours, so GMT+1). There’s also a chat, although we usually dwell in the Indievault chat. Recently I found this nice blog post from William Dyce about the Global Game Jam. The lessons he claims to have learned are really useful, and it was nice of him to share them. I will instead just post a recap and some impressions on the whole event. With photos. Last week I went back to Verona, Italy (from Spain where I am at the moment) to attend the Global Game Jam 2011. I could have done it here, since there was a venue at the Universidad Complutense, but the occasion in Verona was much too interesting to lose it. The fact is that Federico Fasce of Urustar is reorganizing the italian chapter of the IGDA, and he scheduled a meeting just before the GGJ, thanks to the University of Verona that granted a conference room. The meeting was nice although a bit confused (some people didn’t really know what the IGDA chapter was about), and it was followed by some really cool speeches by people such as Federico himself, Paolo Pedercini of Molleindustria (in video form), the guys from Vae Victis, the guys from Darkwave Games, Paolo Tajè of BloodyMonkey, Bernardo Antonioni of Activision, Francesco Banterle, Vincenzo Lettera of Indievault, and many others. Matteo Bittanti, a videogame scholar, translated the video for the ones who are interested (although seeing the video has an entirely different effect). After the meeting/conference, we had the Global Game Jam (starting friday in the afternoon). After some confusion in group creation, I ended up with the aforementioned Paolo Tajè and the two guys from Santa Ragione (the creators of Fotonica), Pietro Righi Riva and Nicolò Tedeschi. I happened to join them almost by chance, but honestly, it couldn’t have been better. For one, I didn’t have to program: Paolo and Pietro handled all the coding work with Unity (cool, my first non-Flash game!). They did a good job, the game as it was presented at the end of the jam didn’t have any serious bug.The Game Jam was an extraordinary experience. The atmosphere in the corridors, despite the people being destroyed by the 48h effort, was tangible. Everybody worked really hard, and the quality of the games in the end was generally high. There were cool ideas such as in “Survival Jam”, a game that used flocking algorithms to simulate some predator-prey relationships. Cool. Worth mentioning were also “The Last Birthday on Earth” by Urustar and Leonardo Amigoni, which used the microphone to blow out candles on a cake, and “Happy End”, which used both webcam and microphone for interaction. For our game, we came up with a simple idea in terms of gameplay, but we really faced no limits in coming up with the theme of the game. The premise is that some crazy priests are trying to take control of the Earth and perform some birth-increasing actions, like impeding people from using contraceptives, producing holes in condoms and stuff like that. On the other side, the gay people (called “Joy Empire” in our game because of some image that Paolo found) from outer space are trying to convert the cities to their cause. 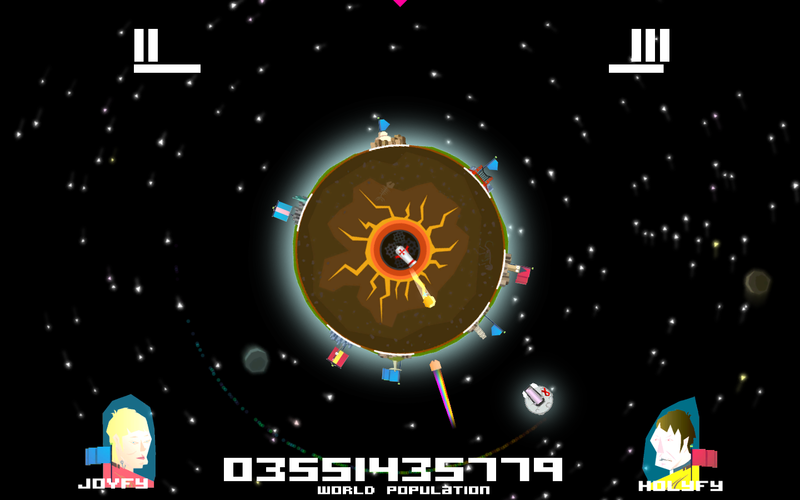 The title of the game is “Clergymen from Inside the Earth VS the Joy Empire from Hotter Space“. The game is a one-button two-players game, and the only purpose of the controls is to fire. Both sides fire with a cannon (the priests from the center of the Earth, the Joy Empire from a satellite orbiting around the planet) to the cities, and they are always aiming to the same point at the same time, so sometimes the projectiles may arrive together to the desired city. When this happens, the game enters a very short button-mashing minigame to resolve the tie. When the priests conquer a city, the population goes up. Viceversa for the Joy Empire. You can download the game from the GGJ website here. Being the theme of the jam “Extinction”, I liked the idea that if the priests won the struggle, humanity would become extinct because of overpopulation. At the same time, if the gay side wins, humanity becomes extinct because no one is left on the planet. This way, the only way for humans to survive is actually to have the players still play, but this – alas – doesn’t happen for very long. A very personal side note: I always felt “Clergymen” has no real social critique intent, the introduction of priests and gays was a product of our wicked minds and of the fast brainstorming made at the beginning of the jam, and we took the images in the game to the extreme just for the sake of fun. If anybody is offended by the game, I apologize, but really nothing was meant to be a judgement on clergymen or gay people. There is so much more to say about the game jam and the meeting… in the meantime, you can take a look at the photos here. Enjoy folks, and viva la Global Game Jam! Finally, the stickers are here! Well, not too bad. The stickers are still very nice and the text is readable enough, considered their small size. Even if this blog may seem only UFHO-related, actually it’s about all things Tiny Colossus. So here I am, to present you our latest game: Ticketless! Actually it went live one week ago, but since I’ve had quite a few adventures and a new life in the meantime, I didn’t have the time to post it here. Ok, I’m also very lazy. The game is very simple, and instructions are provided. Even if the game was intended as an experiment to test the FlashGameLicense platform (thanks guys!) and Flixel, feel free to give us any feedback you want, even if harsh, we would appreciate it! After much toil, the No More Sweden 2010 game jam has come and gone. It was a wonderful experience for me, personally, for I have seen the whole trip somehow like an adventurous journey (fantasy helps making things better). The fact is that it’s a long way from here (in Rome) to Skövde, but it was surely worth it. Cutting away all the unnecessary and personal details of my experience in Sweden, I found a lot of cool people both at the jam and out of it. Erik Svedäng, which invited me in the first place, and Daniel Kaplan (head of Ludosity and co-organizer of the jam) were both very supportive to me, and offered help for housing and such in more than one occasion. Help that was not needed, fortunately. Another cool guy is Daniel Remar, which ultimately won the jam too thanks to a very crazy game (aided, to be honest, by the funny theme made by Erik Sjöstrand). Speaking of game making, I had the pleasure of working with Niklas Åkerblad, which is the bearded guy that made the music and art of Erik’s game Kometen. He’s a very talented painter just taking a look at games to see if it’s worth it, but mainly he’s a funny guy and a good co-worker. He even gave a very cool speech (in my opinion at least) about art in general, and its relation to games. On to the jam then. The rules were that on the first day, everybody had to suggest some themes and write them down on a piece of paper to be put in a bowl. After that, each team picked up 3 themes and started making games. Our themes were initially “Window-licker”, “Idiot” and “Co-op”. We felt like the first two were almost overlapped, so we traded “Idiot” with the Erik Sjöstrand team, getting in return the word “Mus” (mouse, in swedish). After a bit of brainstorming, the idea for our game, later called Rowtard, was to do a navigation game in which there’s to retarded guys on a boat trying to save mice from drowning (because the mice are their best friend, you know). They have to work together, because each one of them has one oar. After some time, the wind will go up and the sail fills, and the retards have to take turns on the rudder and ropes. There should have been also a random disability that showed up affecting both players, making the game less controllable and more difficult, although hopefully more fun. Actually, not much of this worked at the end of the jam, as I incurred in some very bad math obstacles (very bad for me, being a mediocre programmer), but trying to put it all together certainly was a good experience. Also, Niklas was not mad at me for not finishing the game in time. He surely understood the spirit of the jam.